One story underground in a CFA rehearsal hall, a Wesleyan musician slowly rose from his seat and turned to face an attentive crowd of around two dozen onlookers. He lifted his trumpet from its case, but before he could press the curved brass mouthpiece to his lips a voice interjected: It belonged to Nicholas Payton, and he wished to join. All of a sudden, a solo presentation of Wesleyan talent for our visiting artist became a collaborative affair. Payton, a Grammy Award winning multi-instrumentalist whose primary focus is the trumpet, seated himself at the piano and the two quickly began to explore each other’s styles. 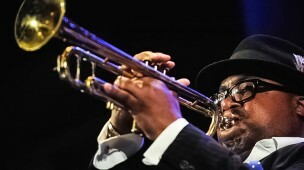 It took a moment for them to connect, but once in sync, Payton supplied a consistent yet fluid musical foundation that never overpowered his partner’s soft and inventive trumpet performance. Growing up in New Orleans, a city as famous for its macabre crypts as for its vibrant life, Payton began his musical career among the living and the dead. He described a youth infused with a rich musical culture. Born to two accomplished musicians in their own right, Payton’s mother was an operatic singer and classical pianist while his father was an electric and upright bass player. He promptly followed in his parents’ footsteps by taking up the trumpet at age four. By the time he was 11, he had begun to play professionally. Surrounded by incredible musical diversity, Payton matured in an irreverent community that disregarded boundaries. He recounted how music never stayed confined to halls and rather shook and danced in the streets as performers stepped out into neighborhoods. Rather than find a singular expertise, musicians challenged themselves to master as many styles as possible in order to become more marketable and viable. Consequently, jazz music became a mixing of different sounds, R&B, funk, blues, and soul, something instinctual and intuitive, too slippery to fit into the confines of a single term. All of this became readily apparent on later that night, as Payton took to the stage of the Crowell Concert Hall to perform with bassist Gerald Cannon and drummer Herlin Riley. Payton began with gliding piano phrases regimented by the soft plucking of Cannon’s upright. Riley’s piercing yet controlled drumming lent the performance a physicality accented by his satisfied grin. I struggled to place their sound, which flirted with jazz, funk and R&B and never quite settled on any one genre. They communicated with one another through their eyes, making contact, correcting tempo and pitch, molding their conversation. Yet another musical exchange manifested from within Payton alone. At times he simultaneously played trumpet and piano, exposing a fascinating inner dialogue to his audience. As I looked around the hall, both young and old members of the Middletown and Wesleyan communities bobbed their heads as if attempting to enter and to contribute to this conversational space. After the trio finished, we managed to respond in our own right—with a standing ovation.